I am mightily looking forward to heading up to Letterkenny next Friday to take part in the North West Words writing weekend. This festival programme looks lively and offers a wide range of readings and workshops, featuring both poets and fiction writers. Among the other writers taking part are Gerard Smyth, Mia Gallagher, and the long suffering Susan Millar DuMars. Friday evening will see the Letterkenny launch of my book The Ghost in the Lobby, when I will be doing a reading alongside Averil Meehan. About the workshop: Kevin Higgins’s workshop ‘Writing New Poems’is for beginner poets, those who’ve had poems published in magazines, and everyone in between. The aim of the workshop is to get each participant working on at least one brand new poem. Kevin will use a pre-existing poem by a published poet as a writing prompt for the session. 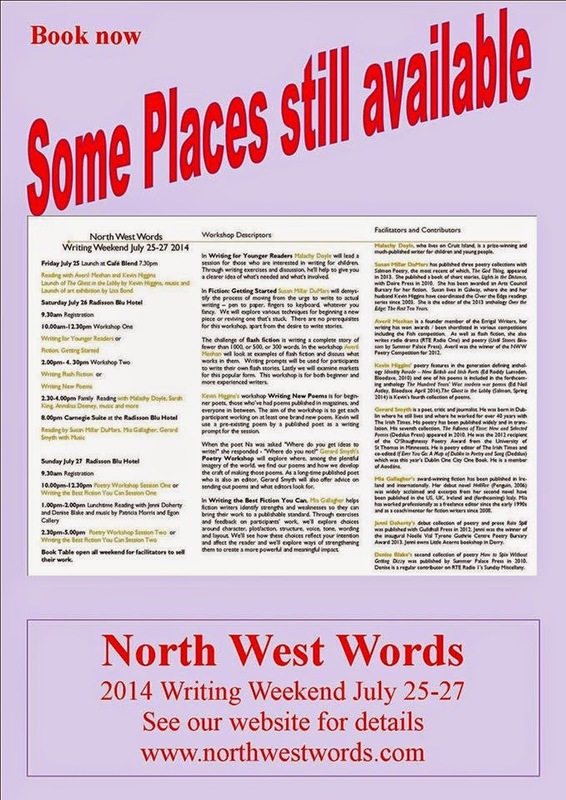 And to put a nice scoop of strawberry ice-cream on an already most excellent slice of apple tart, I also have a poem in the excellent first issue of online publication North West Words, which is published in association with the event.